It has been almost a year since the release of the connected learning principles in March 2012 on connectedlearning.tv. 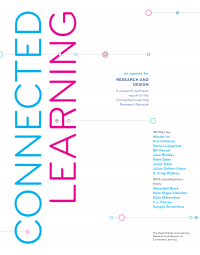 For those of us who are part of the Connected Learning Research Network, this has been a year of digging into our research agenda for connected learning, and testing our hypotheses with ethnographic case studies, design experiments, and the deployment of a national survey. In tandem with these new research activities, we have also been involved in the collaborative writing of a report which synthesizes what we see as the current state of theory and empirical research underlying the connected learning model. We are very pleased to announce the publication of the report as a freely-available pdf. The report is also the first in a new Connected Learning Report series, edited by Ellen Seiter. The connected learning principles were developed as a collaborative endeavor, cutting across research and practice, coordinated by the Digital Media and Learning Initiative. The research report represents the effort of our network to develop a research program tuned to these principles. As a model of learning, connected learning emerges from a wide range of existing research and practice, and is a work in progress, requiring ongoing refinement and testing through research and experimentation. It is both evidence-driven and visionary in its aspirations, and research plays a central role in its ongoing development. It has been quite a learning journey pulling together this report with a group of interdisciplinary scholars and with the support of our network advisors and the team at the DML Hub. Our research network meets four times a year, and for two years, the writing of the report became a focal object for us to learn from our varied perspectives and expertise, and hash out our differences and disagreements. I have survived more than my share of collaborative writing projects, some much heftier than this report, but the depth of engagement, stretching, and learning that I had to do for this synthesis eclipsed my prior collaborative writing efforts to date. We were working across vast differences in methodology (humanistic, clinical, design-based, qualitative, and quantitative), disciplines (psychology, sociology, anthropology, learning sciences, communications, design), in addition to being physically dispersed and all having demanding day jobs. Though not without compromises, I am proud of the fact that the debates, epiphanies,and give-and-take between the nine authors resulted in greater refinement and clarity about our common ground, rather than a watered-down consensus document. The integration of a socio-economic framework with educational research and design represents what I believe is a unique synthesis that mirrors the cross-sector model of connected learning and both a macro and micro learning agenda. Unless we keep in view broader questions of equity and the quality of our shared culture and civic institutions, learning techniques and approaches more often than not reproduce existing structural inequity. Put differently, a learning agenda needs to be part of a social change agenda, a commitment deeply shared by all the report authors. As we stress in the report, the connected learning model builds on a robust body of existing research and practice, and we see the work of the network as one component of this broader conversation and growing evidence base. The writing captures a moment in time in our shared understandings; understandings that we hope and expect will evolve as the model gets tested, challenged, and reworked. The report represents the starting hypotheses that will guide the research of the network in the years to come, and we hope will provide a sounding board for a broader conversation around connected learning. It is amazing that you have survived so many collaborative writing projects. Everyone has their own opinion so I am sure it could not have been easy deciding which route to take when some people bumped heads. Collaborative writing can also be pretty helpful, though, and it is a great example of peer-based learning. I think that collaborative learning is very helpful. It helps people understand different ideas, and come together to decide on them. Sometimes collaborative learning can be hard because not everyone thinks the same. This also relates to peer based learning like Kiana up above said. Learning from others is really helpful and can lead to alot of great ideas. The idea of "collaborative learning" is something that i think is a little controversal becuase on one hand two minds are better than one; however, on the other hand, two distracted minds are not at all productive. I think the idea of working with people is something that has been debated in school systems for a long time, but if used properly, it can be highly effective. I think that it is important to collaborate different styles of learning. I know for me it helps me alot to learn and understand through different ways of learning and not just one boring way all the time. I think diversity and this idea of collaborative learning are very important to create in duality in order to create a culture of innovation and progress; in order to further progress not only American(western) society but the world community as a whole because cultural tolerance would become exponentially greater.